BUFFALO – Calm down, everyone. Sam Reinhart said he simply misspoke following Thursday’s 6-5 overtime loss. The winger never meant to call out the Sabres’ goalies. Reinhart issued a mea culpa this afternoon, saying when a team official informed him late Thursday of how his comments were being taken on Twitter, he was rattled thinking what he said came off the wrong way. “That’s not what I meant at all,” Reinhart said inside KeyBank Center. This afternoon, Reinhart, 23, said the rest of the interview showcased his true feelings. “If you follow through with the interview a little bit … near the end, I’m saying we all need to come back and defend more,” Reinhart said. “I was trying to say we need more for our goalies. I think it doesn’t take a hockey genius to know (Carter Hutton and Linus Ullmark have) been our two best guys all year. So I think that’s on me. I was lost in translation. Reinhart said he sent the goalies a text message warning them about his comments. Ullmark played Thursday. Meanwhile, coach Phil Housley said he misunderstood a question – he was asked if the Sabres’ current defense corps can keep playing – following the game. Housley replied by saying it was general manager Jason Botterill’s job. “I took it as are there any players coming up from Rochester and that’s Jason’s job,” Housley said this afternoon. “That’s what I meant by that. Jason and I talk on a day-to-day basis about our team. 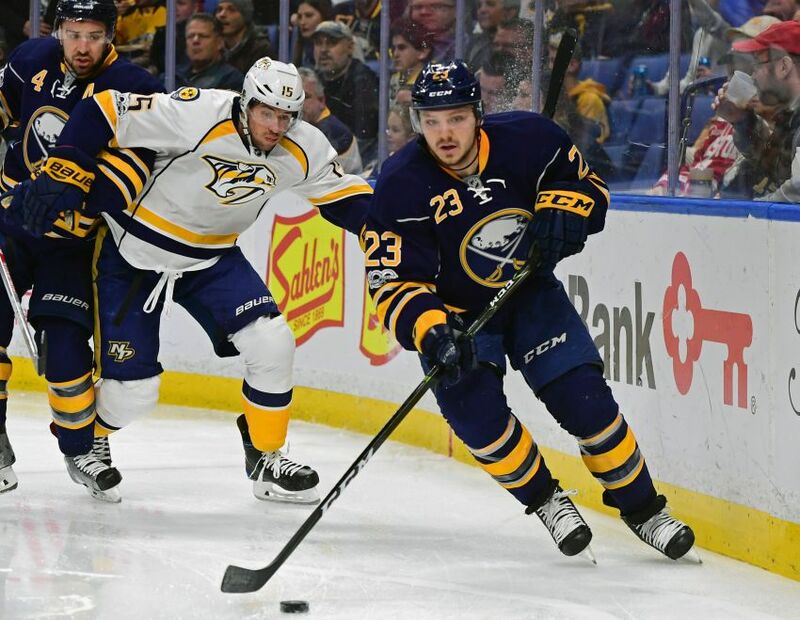 In other news, the Sabres sent defenseman Casey Nelson, out since suffering an upper-body injury Dec. 4, to the Rochester Americans on a conditioning assignment this morning. Nelson, 26, has missed the last 26 games. The Amerks host the Springfield Thunderbirds tonight. Check back later for more! The Sabres host the Detroit Red Wings on Saturday afternoon.